She just celebrated six months sober and looks healthier than ever. 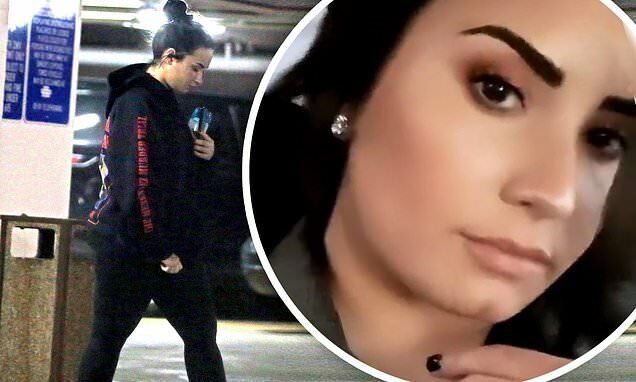 And Demi Lovato continued her clean living with a trip to the gym on Friday. The 26-year-old singer was spotted wearing her gym gear after a work in Los Angeles. The star - who is now dating her sober companion Henri Levy - looked focused as she wore all black and had her cellphone in her hand. She kept her black tresses in an updo and appeared to be make-up free as she continued to enjoy her new lease of life. Later on Friday, she revealed her flawless make-up application - commenting on the highlight on her striking cheekbones on her Instagram Stories. 'That highlight thooo', (sic) she captioned a selfie, as she appeared to travel in a vehicle. The former Disney Channel star not only revealed on fleek cheeks, but perfectly groomed eyebrows. Demi marked her sobriety with cake from her team, after her apparent overdose last July.